Visit the PaperTemptress's Community blog to find out where to go to get the first piece of the puzzle and read the details on how to enter. Just a word to the wise, you'll want to follow the hop each day in order because the clue pieces will become a phrase. You'll need this phrase to enter the random drawing. What can you win? 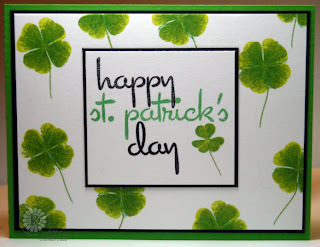 One lucky winner will win Kitchen Sink Stamps newly released Multi Step Shamrock and Clover, 1 each of 2 inks - Memento Cottage Ivy & Pear Tart and a St. Patty's KSS Green Package from PaperTemptress. Be sure to stop back on Monday, as all the Kitchen Sink Stamp Designers will be showcasing the Multi Step Shamrocks & Clover along with papers from the St. Patty's KSS Green Package. If you just can't wait and you "need" these stamps now, just click here then enter code LISA10KSS to save 10% on all your purchases at Kitchen Sink Stamps. PaperTemptress is also having a March Madness Sale - Premium Glossy, Ultimate Glossy and Vellum Paperlines are 30% off! Plus the Leather line is 25% off! Don't forget to check out the new PaperTemptress's PaperRings, Bits & Pieces, and the Bit's of Strips. Great St Paddy's card, it just jumped right off the screen! This is one fabulous card. I just love PT and KSS together. Also I wanted to wish you a Happy Birthday. Hope your day is the best ever.